Every Spring, about the end of April, I start watching for the roses to bloom. The first one to go is always the Lady Bank's rose that's on the site gate arbor. After that, the rose hedge starts to go, and then about now, all of the rest of the roses join in. It's my favorite. This year is especially exciting because I have several new roses that were given to me by a friend before she moved to California, and so my rose collection effectively doubled instantly. The roses smell AMAZING. I haven't brought any inside yet because I can't bear to take them out of the garden, but as good as they smell, it's only a matter of time before I succumb. The most fragrant of the roses is one that's new to me, Variegata di Bologna. It has a clean, fresh scent that's just intoxicating. I've never had a striped rose before and I probably would have never bought one because I would have thought I wouldn't like it. But I loooove it, and not just because of how it smells. It's so pretty! The other new rose that's blooming is one that I have photographed in rose gardens over and over and over again because it's just that perfect. It's called "Cottage Rose" and it's a beautiful pink cabbage rose. I don't have a picture of the gorgeous quartered bloom, but trust me, it's stunning. And also smells fantastic. I am so thankful to have been given this rose. Another fragrant rose that I brought with me from my old house is this beautiful Rugosa rose called "Hansa." It's been transplanted half a dozen times (eeep) and still is going strong. I just love Rugosa roses for this reason. The house also came with this mystery rose that grows on the back fence. It surprises me every year because it's huge and it grows and blooms in nearly full shade. I suspect it may be a Dr. Huey growing from a rootstock. It grows from the other side of the chain link fence, and the neighbor (who is also a Master Gardener) has tried to get rid of it, but it just keeps growing. Now it's all on my side, and the roots are under the hedge, so I think we're stuck with it. There are worse fates. You can see it even better in the pictures I posted last year of it blooming. 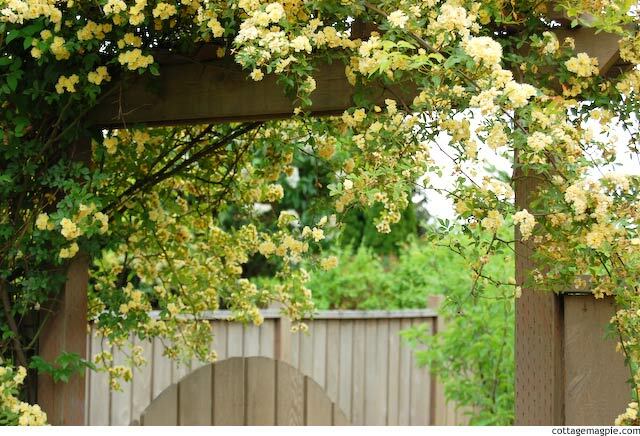 The first rose I bought and planted myself is the Lady Bank's rose that's on the arbor gate. It blooms early, and only once, and when it's done that's it for the year. But it's worth it to see the cascades of little yellow flowers coming down. There's a clematis on there with it, too, so it will give us purple flowers as the season continues. The most traffic-stopping roses I have planted by far are the roses in the rose hedge. I've been gradually adding a couple of plants each year, bought either on clearance or bareroot at the beginning of the season, and eventually they will stretch across the entire front of my front garden along the fence. The first six I got for $2 each on clearance and I didn't know what colors they were. They're Knock Out roses, and I have a mix of the regular bright bright double pink ones and the slightly lighter medium pink double ones. These roses are amazing. They bloom like nobody's business and you can cut them with hedge clippers in Spring to keep their shape. They don't get any blackspot (a plague in my region) and just go and go and go. They're not fancy, but they're great for what I'm using them for. My only wish is that I had all medium pink ones beause the bright ones are SO BRIGHT, but really, I'm lucky to have so many roses blooming without maintenance, so I won't complain. I've started underplanting the hedge with catmint (this is "Walker's Low"). I started with one plant and divide it every year. Soon I'll have enough to stretch the whole way along with the roses. I love how the purple and pink look together. Plus it keeps the deer out of my garden. It's always a process! :-) I'm hoping this year is my year, though, to finish this front border. I'll have to wait on the roses, but I have been able to scrounge up the fence posts and I have lots of catmint. Maybe I'll get lucky and find some of the roses on clearance this fall. Meanwhile, there are still a few more roses crammed into my garden, but none of them are blooming yet this year. I'll let you know when they do! 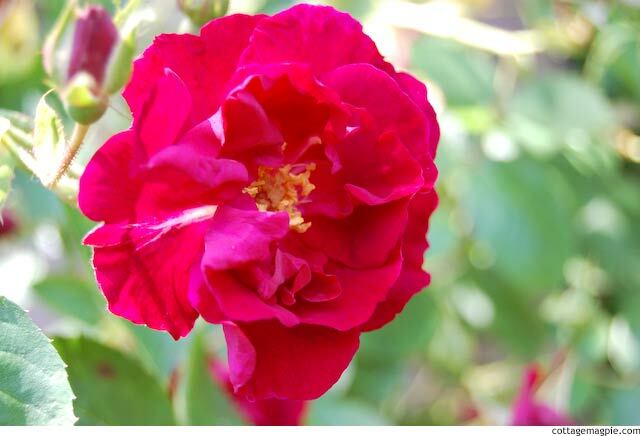 Do you have any roses in your garden?